In a week when I injured my leg jumping from a wall and went on to get my car clamped I have to celebrate my own humanity, the flaws in myself, my own stupidity. I present a portrait of both myself and my car sporting immobility boots. So I can have not better companion than Czeslaw Milosz, the Polish Nobel Laureate who was born on this day in 1911. Born in what is today Lithuania in what was then the Russian Empire, but speaking Polish, Milosz has that quality common amongst writers who struggle between their national and linguistic identities. You will see it in Irish, Indian and African writers who write in English. The disassociation between language and race promotes a focus on the weight of words, how words can shape meaning and identity. Milosz was happy to resolve his identity by a refusal to identify. To the ire of various activists he refused to be either Polish or Lithuanian. Milosz went on to become a citizen of Nazi Poland. He refused to become a supporter of the short lived Warsaw uprising, holding to his determination of what he was not. Then he was a comrade of Stalinist Russian Poland and eventually became the polar opposite; a citizen of the United States of America. As to my own stupidity….volumes could not cover it. I could fill a library. would have tended nevertheless toward the candle’s flame. On this day in 1895 two controversial world leaders were born. Ahmet Muhtar Zogolli was born to a wealthy landowning family in Albania. He was appointed a district governor ahead of his older half brother, perhaps because of his mothers royal connections. He signed the Albanian declaration of independence from the Ottoman Empire and was instrumental in creating Albania as a parliamentary democracy. He was elected first president of Albania in 1925. In 1928 he turned Albania into a Kingdom and appointed himself King Zog I, King of the Albanians. He was not recognized by European royalty who looked down upon self appointed kings, but he was well regarded in the Turkish/Arabic world. Zog relied heavily on loans from Italy to prop up the Albanian Economy. His military was run by Italian officers. In classic Albanian style there were 600 blood feuds against him, and he survived 55 assassination attempts. His Son and Heir, Leka, was born in April 1939. At the same time the Italians moved on Albania. Zog cleaned the gold out of the Central Bank, packed up his wife, child and the cash and fled the country. He spent the rest of his life living in faded grandeur as a King in exile. The other was Juan Perón, thrice elected President of Argentina, husband to Eva Perón nicknamed Evita, star of the Rice & Webber Musical. Perón was raised from the entrepreneurial classes in Argentina, with roots in Sardinia. He was sent to Catholic boarding school and joined the military. He enjoyed a successful career as an officer and was sent to Mussolini’s Italy to study mountain warfare, for which the Italian Alpini were famous. He was in Italy in 1939 when Mussolini was invading Albania. In Europe Perón closely observed the governing structures of Fascim, Military dictatorship, Communism and Social democracy and concluded that the latter was the best form of government. He preferred social democracy to liberal democracy, a view I share myself. For everyone who expresses positive opinions on Perón you will find three people who hate him. Throughout his career he focused on three principles. Government should be democratic, alleviation of poverty and dignity of work. Again, I happen to be aligned with him on these. His three presidencies were interspersed with periods of military dictatorship. His life was frequently at risk and he had to flee the country and live in exile. The capitalists hated him because he fought against the exploitation of workers. The conservative Catholics hated him for passing laws permitting divorce and legalising prostitution. The socialists and the communists hated him because they felt he was too supportive of the entrepreneurial and capitalist system. The military dictators hated him as a successful military officer who would not back their coups d’état or support the rule of military Juntas. All sides contending for rule accused him of corruption, living a life of luxury through embezzlement of the public purse. Meanwhile he was loved by the people, because he fought for them. Don’t get me wrong here, I know Perón was no angel. He was anti-education and I have a major problem with that position. He was in a constant war with third level institutions. Slogans abounded on the streets such as “Promote democracy- kill a student” or “Shoes not Books”. His politics made for some very strange bedfellows. He was on good terms with Che Guevara and Salvador Allende. But he was a realist about US involvement in the overthrow of Allende and support for General Pinochet. He warned the Argentinian People that this could happen to him. He was also accused of having an affair with a 13 year old girl, on which accusation he commented “13? I am not superstitious”. He did his best to steer Argentina down a middle path in the cold war, attempting to maintain relations with both USA and Russia and gaining favour with neither regime. His motivation was to maintain Argentinian independence. He made Argentina the strongest economy in Latin America, despite overt attempts by the USA to undermine his reform government. But Perón avoided turning his nation into another Cuba, or Chile. A complex politician it is interesting to compare his career with that of Zog, who was a perfect example of someone who profited from rule. Perón worked all his life for his country, despite the hatred and criticism he faced. I believe he will go down in history as a good politician and a true patriot and that history will remember him well. He was desecrated in death, his mausoleum raided and his hands cut off with a chainsaw. His ceremonial personal effects were stolen. On this day in 1957 the Soviet Union launched Sputnik. The USA woke up to the fact that the space race had begun, and they were not even at the starting blocks. With the launch of Sputnik the Russians engineered what was called by Eisenhower “the Sputnik crisis”. The Russians proved they had rockets capable of launching nuclear warheads and reaching the USA. The payload of 83 Kilos was initially dismissed by the US scientists as preposterous. They were planning on launching a sub 10 kilo package and did not have the raw power available to shift such a large mass into orbit. With the launch of Sputnik the world changed overnight. The USA, which thought of itself as the premier power in the world, found itself in second place. In response Eisenhower commissioned the creation of Defense Advanced Research Projects Agency (DARPA). DARPA pioneered computer networking and led directly to the creation of the Internet. At the same time he created NASA to take responsibility for space exploration from the Military arms, which were focused on development of warhead delivery systems. In the United Kingdom the launch of Sputnik brought into sharp relief that the nation, once the workshop of the world, was now a technological backwater. Great Britain did not have the capability to enter the space race. On this day in 1857 the Russian ship of the line Lefort was lost in a squall en route from Tallinn to St Petersburg. She went down with 756 crew, 53 wives and 17 children. Press reported that there was 1 survivor. Rated for 84 guns she carried 95 which would make her top heavy. The board of enquiry noted that her cargo was not balanced properly so she did not have enough ballast low down in the hull to help the ship right herself. When the squall struck she leaned hard over. There was speculation that the gun ports were open to provide ventilation, in which case they would have allowed the water to flood in as she heeled. This is exactly how the Mary Rose is thought to have floundered. A shipping disaster in a far away sea a long time ago comes sharply into focus when your own son is travelling on a ferry on the very anniversary en route from Helsinki to Tallinn, through the same waters, with a storm warning in place. Too proud, too proud, what a press she bore! Royal, and all her royals wore. Sharp with her, shorten sail! Too late; lost; gone with the gale. Raced down decks, round messes of mortals. Was around them, bound them or wound them with her. Education is important because it gives you the tools to evaluate what you are being told and to decide for yourself what is true and what is manure. Ignorance is the lack of education to equip you to make these decisions. Gullibility is the lack of ability to make the decisions despite being equipped with education. I have more time for the Ignorant than I have for the Gullible. For the latter there is no excuse. The Battle of Borodino was fought on Sept 7th, 1812. It was the deadliest day of the Napoleonic Wars with casualties around 70,000. Fought on the approach to Moscow it was the final attempt by the Russians to prevent Napoleons “Grande Armée” from reaching the capital. 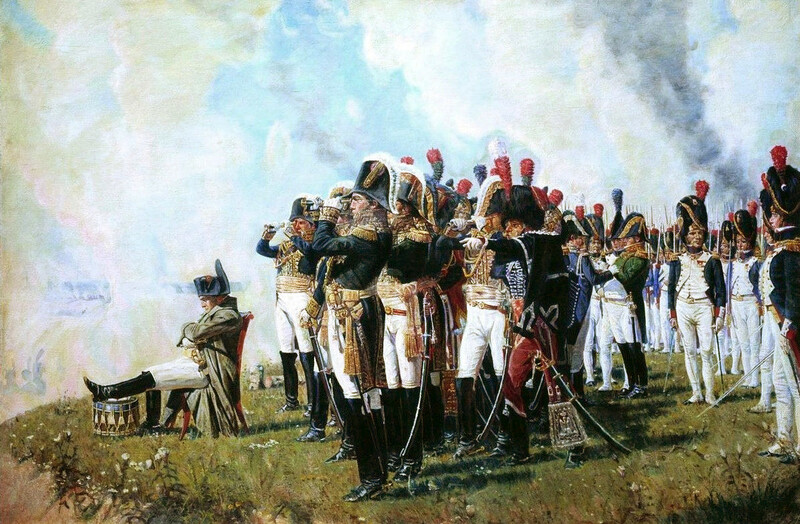 In one sense the battle was a failure for the Russians, who were yet again defeated by Napoleon. On the other hand, as at Eylau in 1807, the Russians were beaten but not defeated. They retired from the field intact. They did not surrender. The Czar did not bend the knee and agree surrender terms. The Russians had enough of being beaten by the French. Thereafter they pursued the Fabian strategy. They kept their army intact but at a safe distance from Napoleon. They shadowed his moves but refused to engage. Napoleon arrived in Moscow to find a city deserted and emptied of supplies. As winter approached he realised that he was unable to sustain his army due to the length of the supply lines. The Grand Armée then began the long and ignominious retreat. All the way they were shadowed by the Russian Army, meaning they could not disperse the troops to live off the land. Foraging parties soon learned how well suited the lightly mounted Cossaks were to skirmishing duties. The French were forced to keep in column and march west. Then the weather turned, the snow fell and the Grand Armée was no more.